The beautiful Cetara's beach, made up of sand, many pebbles and small rock, is located a short distance from the city of Salerno and it is easily reachable by public transport. 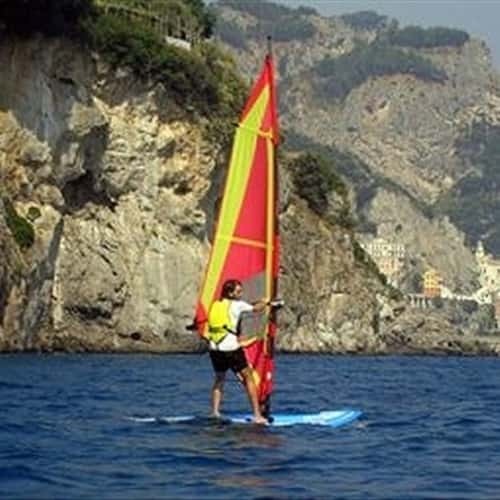 It is a quiet and very suggestive location, ideal for windsurfers and kite surfers. The area, in fact, is particularly exposed to thermal winds, especially during the hottest hours of the day, blowing from the west with speeds of around 10-15 knots, during the period June-September. The water quality is clean and the sea temperature ranges from 10° to 25°C, depending upon the time of the year. Moreover, the valuable majolica dome of St. Peter Church and the coastal tower are excellent visual references. There is a surf shop nearby the beach, where you can rent the equipment. Due to the small size of Cetara's beach, we suggest to be aware of other kiters and surfers in your immediate area, and keep a look out for swimmers and bathers in and around the water.